The Analytics page present summary of all campaigns statistics that send by Emails and SMS. For example: number of opening & clicking on campaign, clicking split and information about contacts that performed action in the campaign. Click on “Analytics” in the top menu. In this page you can see all sent campaigns statistics. Also, you can search specific campaign by typing the campaign details. Send ID – unique number that given by the system to each mail. Campaign name – campaign name as you define while created the campaign. Campaign subject – campaign subject as you define while created the campaign. Created on – date of campaign created, in that screen appear only campaigns that sent. Last sent – date of campaign sent. If the campaign sent few times in a few dates, the last sending will appear. Sent – the number of contacts the campaign has been sent to. Opened – number of opening the campaign. If same contact opened the campaign 3 times, the number of opening will count 3). Opened Unique – Number of contacts which opened the campaign. Count perform by the number of contacts, not number of openings. If specific contact opened the campaign 3 times, it will count once. Clicked – number of clicking on one of the campaign links. Clicked unique – count one contact who clicked even if clicked on few links. Bounced – email that hasn’t reach its destiny and return back by the contact Email server. Hard Bounced – Email address doesn’t exist or typed wrong, for Example: Contact who left his job and got a new Email address, the old one isn’t relevant anymore. Soft Bounced – usually, temporary problem in Email such as full box or server issues. The name of the campaign, send ID, Campaign subject and the mail address that the mail will sent from. Clicking on Sending details show the Start & End time of all sending for all the groups in the relevant campaign. Performance funnel let you view and analysis the campaign performance, track the sending details, how many contacts the campaign sent to, how many receive it, amount of clicked and opened. Contact asked to unsubscribe from mail list. Email address defined as bounced according to bouncing policy. Invalid address due to syntax. Received – The number and percentage of contacts who received the campaign. Bounced – number of bounced Emails. Opens – The number and percentage of minimum contacts that have seen the campaign or click on “Show images”. Didn’t open – maximum number of contacts which didn’t opened or sew the campaign. Clicked – number and average of contacts which clicked on one link in the campaign at least or clicked on “view in Explorer”. Didn’t click – number of contacts which didn’t clicked on no links in the campaign. Here you can see all contacts and their details, also their rank in the system by clicking the flower. You can export the list to CSV file, by clicking on the export button on the top right. On the main Analytics page you can see Clicking map. Here you can see the click percentage of each campaign link, and know who the contacts that clicked on each link are. On the left you can see campaign preview, and in areas where there are links – a layer of color will appear. When you point on it, you’ll see the link address. 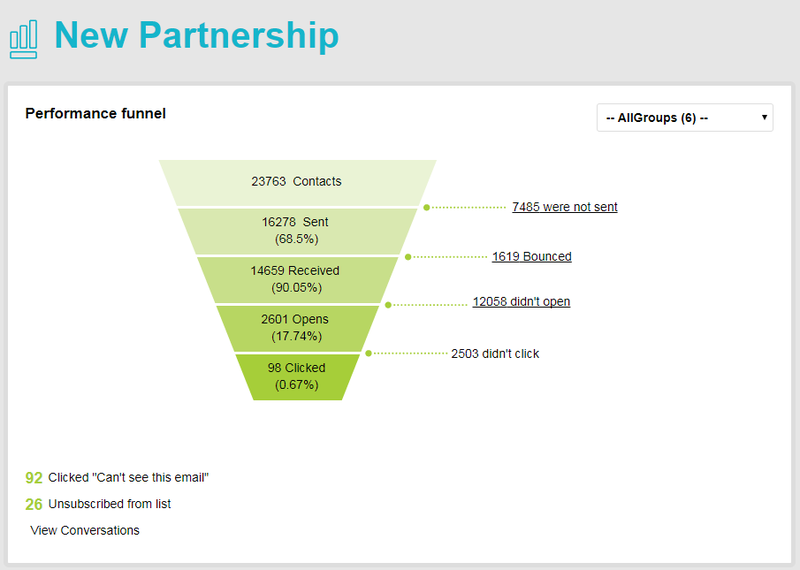 While point on each link, you can see click percentage and number of contacts who clicked on. Right to the campaign, appear list of the links, number and percentage of clicking. Clicking on each raw, lead you to the contacts list that clicked on each link. Below the click map, you can see data by geographic location in the world, and see the countries in which the campaign was opened or clicked.